New Orleans 28, Philadelphia 13: Marcus knows how you feel, Andy. Marcus knows how you feel. Michael Vick was sacked seven times tonight and, well, things were not good. The Saints first got on the board in a gutting 14-point swing for the Eagles. Vick, looking for Brent Celek from the 1-yard line, was intercepted and Patrick Robinson took it 99 yards for a touchdown. From there, the Saints jumped out to a 21-3 lead by halftime. We thought the Eagles were back in the game thanks to a crazy hiding Riley Cooper—more on that to come—but it was not to be. 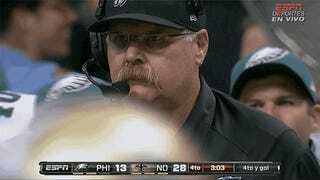 Philly did add a 77-yard hook up between Vick and DeSean Jackson but that was about it for the Eagles. If Andy ribbity-Reid up there is not good enough for you, please enjoy Mark Ingram bouncing and spinning off Nnamdi Asomugha early in the second quarter.